After recently snapping a beautiful corner in our KAMERS Online Store with shades of teal and white for Instagram, we realised we have quite a trend going here. So we decided to put together a colour inspiration post with products from our shop ranging between teal, turquoise and white. Combined with a few beautiful teal-trend images found on our friends at Plascon’s Pinterest profile, we think it’s a winning combination! What do you think? Like any of these items? Find links below each picture and shop to your heart’s content. 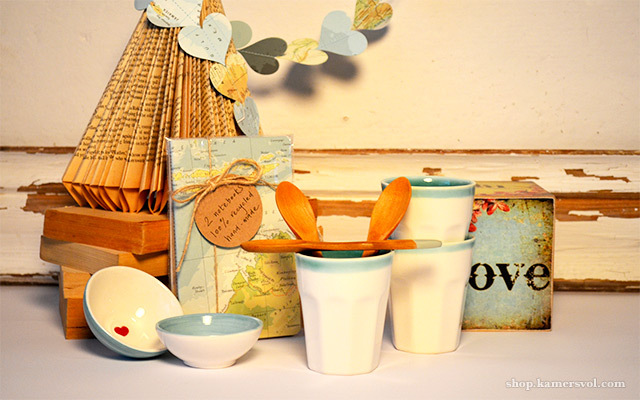 Beautiful small ceramic bowls in ocean blue and white; set of two handmade, recycled atlas notebooks; handmade, upcycled 3D atlas garland; ceramic espresso cups in teal and white; set of three dipped wooden teaspoons; vintage money box. Upcycled 3D atlas garland; set of two handmade, recycled atlas notebooks. Ceramic espresso cups in teal and white; set of three dipped wooden teaspoons; teal inspiration by Johnny Miller via Plascon on Pinterest. Special “A tree is like a mother’s love – strong, deep and wide” print; ceramic espresso cup in teal and white; set of three dipped wooden teaspoons; teal inspiration from desiretoinspire.net, found via Plascon on Pinterest. Blue bee small ceramic bowl; “Hop to it” set of three quirky prints. 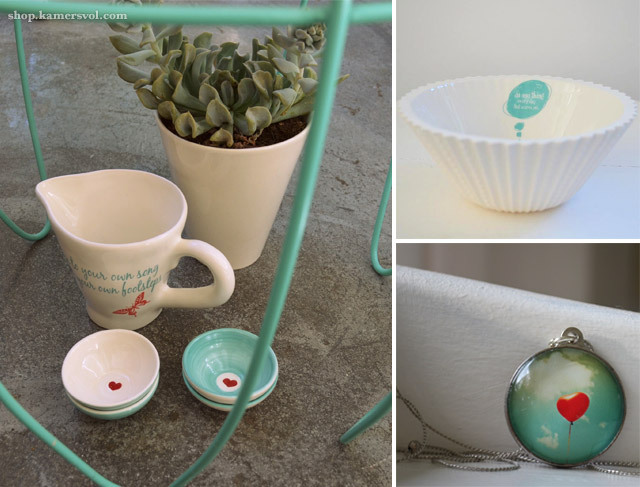 “Dance to your own song, create your own footsteps” ceramic milk jug; small ceramic bowls in ocean blue and white; “Do one thing every day that scares you” medium ceramic bowl; vintage red heart balloon pendant. 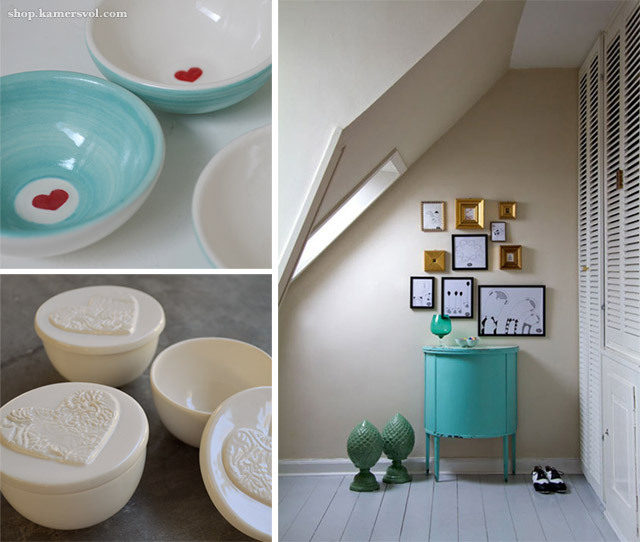 Handmade and painted small ceramic bowls in ocean blue and white; versatile flat heart ceramic pot; teal inspiration from interiorstyle.tumblr.com, found via Plascon on Pinterest. “Few are those who see with their own eyes and feel with their own hearts” – Albert Einstein limited edition print; teal inspiration by Create H Interior Design via Plascon on Pinterest. 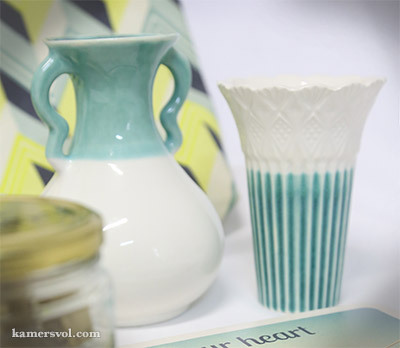 And lastly, a special first sneak peek at two gorgeous teal and white ceramic vases, created exclusively for our KAMERS range. These will be available at KAMERS 2013 in Bloemfontein 3-6 October, Stellenbosch 5-10 November and Irene, Pretoria 3-8 December. Tags: KAMERS Online Store, online shopping, Plascon, teal, white. Bookmark the permalink.